Vlog Brothers - We got our first initial boost from John Green and Hank Green promoting us on tumblr. Tom and Vondell are vested members of the Nerd Fighter community and we honestly couldn't have done it without them. I wasn't a Nerd Fighter myself (myself being Brad) but I guess I am now! Anyway, THANK YOU John and Hank! :( - After reaching our funding goal in the first 36 hours the following two days were dismal. At this point I put in my two week's notice at my day job so that, having already quit, it would be somewhat acceptable for me to slack off and focus on Kickstarter for the next two weeks and SUPER acceptable to focus on my Kickstarter on the last two weeks, since I would technically be unemployed. Machine of Death - We bounced back on Monday with both a blog post from the Laughing Squid and a backer update from the Machine of Death. We heard about Machine of Death a few weeks before we both launched, through our mutual friend Ryan North. Initially we were both cautious about interacting with each other since our games were so similar and we didn't want no legal trouble. But ultimately we decided to cross promote each other, which was a great idea, as you can see a similar bump on the Machine of Death's Kicktraq chart around the same time. Deluxe Pack Week - My first week of unemployment! I hope senpei notices me this week! Because I had nothing to do but focus on the Kickstarter, we were able to get a bunch of HUGE deals and licensed cards for DELUXE PACK backers. 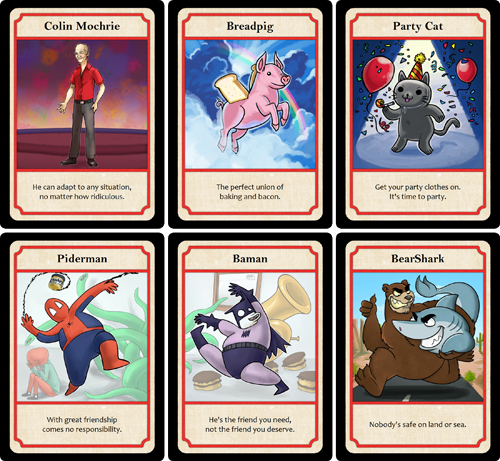 We were able to get Baman Piderman cards from Lindsey and Alex, a Colin Mochrie card, a BearShark card from College Humor, Party Cat from Nedroid, the Bravest Warriors by Pendleton Ward and T-Rex from Dinosaur Comics. And of course, Breadpig. We also added a new Mad Scientist card and three items based on backer suggestions. This is all on top of our initial Keyboard Cat, Grumpy Cat, Nyan Cat, Scumbag Hat and Cyberspace cards. That's ... so many cards! We had to bring on several new artists to help with all this new artwork, which was all produced in the last 7 days. And it's a good thing we did, too, because Vondell's tablet broke! He got hit by a car two weeks ago and then his tablet broke this week! And he's also 19 and preparing for his college midterms right now - the fact that Vondell is getting anything done at all is amazing. Adding all these cards to the $60 DELUXE PACK has raised our average pledge amount (the DELUXE PACK is now our highest-earning reward tier - it used to be in third place behind the HERO PACK and BASIC PACK) and it's steadily increased our daily haul. So that's where we are! For the final week of the Kickstarter campaign, we're going to be contacting gaming blogs and news outlets and trying to get as much coverage as possible, because we made a game where Colin Mochrie can use the Philosopher's Stone to fight Grumpy Cat and that's a pretty special thing! Lets keep pushing on so we can reach our $200,000 stretch goal where we'll be making an animated short based on Story War! We're already talking to some animators and working on the script! What do you guys think about this: A cartoon where the Fairy and Goblin team up against Medusa and the Gremlin in Capital City? The Kickstarter campaign ends on Friday, which, coincidentally is exactly when PAX East starts. And Cantrip Games is going to be there, at PAX East, in a demo booth, where anyone can show up and jump into around of Story War. Our artist Vondell will also be there drawing and signing sketches until his hand falls off. So if you're going to be at PAX East, feel free to say hi! We wanted to thank you guys so much for being such excellent backers and also having such good suggestions! It's really great to see so many people being as excited about Story War as we are! PS: We've unlocked a new game mode called Hero's Saga! Go to the Kickstarter page to read about it - this update is already way too long! PPS: We noticed there's only a single Battlefield card in the DELUXE PACK and there... should be more! Suggest some Battlefield cards in the comments and we'll pick three and add them to the DELUXE PACK! Award-winning Author, LaNiyah Bailey likes this update. Within the last 12 minutes of the Kickstarter I backed you guys! My best friend told me about it earlier this week and I almost forgot to back you guys!! I love your game idea! I cannot wait for the physical copy! Sorry for the exclamation points! The Internet: It's a series of tubes! Don't clog them up. A Colossal Blender: Vacuum sealed and powered by an endless supple of energy. The Sun: The sun is a miasma of incandescent plasma. Ancient Library: This labyrinth holds all knowledge defeating any foe, just don't make a ruckus. Speeding Train: An out of control locomotive racing towards a cliff's edge! Inside a Human Body: Hope no one turns the shrink ray to reverse! Alpha Centuri: It's only a few light years away! So the collateral damage should be minimal. ACME Universe: Physics only work when you notice that they should. Bigbywolfe the Hamlet book is called "To Be or not to be" it's by Ryan North. It is totally backed. I can't seem to find the Hamlet book mentioned. Anyone able to give a link? The crossover with job hunters sounds awesome! There could even be a medkit item and having the house as an arena would be really cool. It would stop anything perceived as violence with the knock out darts. So you would have to be creative about how you fought or impervious to darts! I think there should be one like "grandma's cellar" who knows what happens down there? A cross over with Job Hunters with the house or arena as a battle field or even make some items based off iconic things from the show eg. tiny marshmallows sweet enough to bring anyone together and get them to let down their guard. Doll House, including children intending to play with you. In line to use the bathroom (or any other queue). Hospital - Who knew a place of recovery had so many sharp objects? Battle of the Bands - A battle to the...death metal? Field. Come on meta jokes. Football Stadium/Soccer(football) Field, BaseBall Field, Etc. The Colorless Zone - everything is shades of black and white. Like in OZ The Great and Powerful and Wizard of OZ. Evil Baby Orphanage has to be a battlefield. Just think about it you could try and convince baby Hitler to assist you in battle. Loading Screen. Could be like the assassin's creed loading screen just an infinite plane or have an AJAX loading thingy in the middle of the art and nothing else. Food World - You got beef! Well.... so does food world, big whoop wanna fight about it? Belly of the Beast - What beast? I don't know but winning the battle is the least of ones worries, finding a safe way out afterwards is a problem in its own right. Beware the sea of stomach acid, stenches of half digested food, and parasites! City of Angels - No not that awful movie, or that place that got lost in the great earthshake of 2022. The City of Angels, home of the bank of indulgences, the gold harp factory, the cloud drive and of course your good side when it is not stopping you from making bad decisions. Robotworld - Something aching to Cybertron. Thank you very much for the update - it's always great to see some "behind the curtain" stuff as far as Kickstarter itself is concerned. In regards to animators, you could maybe talk to Andrew Kepple? He's a big fan of Colin Mochrie (and Jesus H. Christ) and he might be down for it. Cubical Office - Proving hell can be made of just 3 walls. The Time Warp - Just a jump to left. And a Million years to the right. Monster Island - Home place of giant monsters. With a great retirement community. The Playground - Where all childhood issues are resolved. Blue Light Sale - Special pricing on stuff you need and just got to have. Mountains of Madness - Antarctic wasteland of a time long past. Valley of 100,000 Rakes - Place of constant danger for even the fleetest of foot. Beware the tall grass. I like the idea of a library and deserted island! - A blank stage, the most annoyingly hard battlefield on which to choose your warrior because anyone could play anything. Top of the Empire State Building - Come to find your long-lost lover? 2 enter, 1 leaves! On A Boat - Self-explanatory. Comic convention / PAX - Something where nerds are afoot. I love the library idea in the earlier comment. Sounds hilarious. Cruise Ship - A battle on the open seas, and it's Congo Night later at 9! Hugeberg - A ENORMOUS city, where each warrior is the size of an ant. Fireball Land - Everything is fire. Quick questions and I do apologize if this was mentioned already. I'm registered at the sketchy deluxe pack. Was there any mentions of being able to add on a certain extra $$$ to get a second deluxe pack for this tier? Essentially I'm looking at the "Double Deluxe Pack" but I want to keep the sketch with mine. Thanks and lets take this kickstarter to the mooon! Deserted Island - There may be treasure here, or there may just be coconuts. Gingerbread House - Who was the architect who thought Candy Canes would be a strong foundation? Poppy Fields - Stick to the Yellow Brick Road, or you'll get very sleepy. Medieval Torture Chamber - Half of these devices will be names for metal bands in 500 years time. @Mathew Gibbons I like your Santa's Workshop idea. Rhymeland - for rhyming deeds success is guaranteed. Black Forest ...though you guys probably already have a Spooky/Magic forest of some sort. Monument Valley - like the real one or one full of Monuments? White room. an empty cube. Peaceful Garden/Zen Garden. violence and violets. Small Room - large characters banned? or have severely restricted movements? Minefield - not your field. While you have less than a week left if you're thinking of online creators to contact about Deluxe Edition cards might I suggest The Brothers Chaps and Doug Walker. Having the Nostalgia Critic fight Trogdor would be something amazing. A baby giant's room. Where everything is huge, except you. @Cantripgames I almost forgot... anyword from Pixelscopic on using their Delvers Drop character? They seemed really interested in letting you use their Rogue character as a warrior for story war, their endless drop tower could also make for a really cool battlefield. They will also be at PAX East with you so if it does not come to fruition now it could be something cool that manifests later in an expansions since the end all be all goal was to have this game be like the smash bros of fighting it out. * At a family reunion -- where the Warriors are surprised to discover that they are ALL in fact related. * A Pacifist convention -- defeat your opponents without resorting to violence! Something from Enders Game like the anti-gravity battle room where they train and stuff. You might even be able to add and item or two from it. I would also love to see something from the book Ready Player One. It's one of the best books ever !!!! Love is a battlefield. This fact should be reflected in the DELUXE PACK's battlefield selection. Well, going along with the Hamlet Idea what about Kronborg castle in Denmark? The "Actual" Hamlet's Castle! The ballroom is quite beautiful. and there is a courtyard? or just a ballroom? classy dance off! Secret Laboratory! for the Mad Scientist's twisted experiments. River of Lethe - one of the rivers of Hades. those who drink from it forget? Invisible Island: where everything is invisible...or like those dashed lines that would still be pretty hard to see. Lost world in the Center of the Earth. Trendy Neighborhood! Filled with hippest shops and people who think your not cool enough to be there! Giant's Garden! Check those huge tomatoes! Prison! Shank him with a shiv! Mirror world? like opposite world but right is left? or like LITERAL mirror world? Mirrored trees and mirrored dogs and mirrored balls? Discotheque - Rumble in the Club. the...less classy dance off. also @Martin, Library is GREAT. Your Parent's House "All the comforts of home. All your parent's rules, too." Why not try literary places in the public domain? Dracula's castle, all the locations in Alice in wonderland or oz? Treasure island would be a great place, of course. I'm sure there are lots of fighters, items and battlefields. The Computer - everything is digital now, why not the Story Wars? Alternate Reality: Where there is an evil version of yourself trying to kill you. Sasquatch Den: The hidden home of the elusive Sasquatch. Don't make him angry. He isn't used to having company. Platform World: Make sure to keep moving in this side scrolling nightmare. Closet: Only small adventurers stand a chance in here. ps: Any chance of a John or Hank card? Many days would be made if these existed. I neeeed the library idea! The Sun Boat of RA! The Space between Spaces- where anything and nothing exists at the same time. Under the couch- full of lost and forgotten things including those icky old gummy bears. Community College- full of hopes, dreams, and overworked students from all walks of life. Perhaps it is too late for cross promotion but as a battlefield you could talk to Monte Cook about using his Kickstarted RPG "Numenera".